Alessandro is foreign law clerk at Davies & Associates, with a practice focused particularly on assisting clients seeking dual citizenship. He is licensed to practice the law in Italy since 2006. 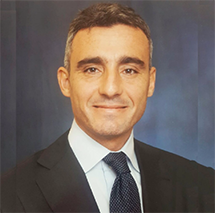 As an Italian attorney, Alessandro has more than 10 years of experience in practicing the law, which allows him to assist and support Italians who may need an Italian attorney during their visits abroad. Alessandro works with the Italian Consulate in Miami, and with the other Italian Consulates all over US, assisting clients during the complex procedure to get the Italian citizenship, Law no. 91 February 5th 1992 (DPR no. 572 of 12th October 1993 and DPR no.362 of 18th April 1994). He's specialized in the procedure by descent " Jure Sanguinis", by marriage " Jure Matrimonii", residence in Italy, and Citizenship for minors. In Italy, Alessandro practiced civil law, specializing in real estate, corporate and torts law. He also has an extensive experience in criminal law. A native Italian speaker, Alessandro also speaks fluent English and Spanish. Florida Bar "Certified Foreign Legal Consultant" not admitted to practice Law in Florida. Italy-America Chamber of Commerce Southeast Inc.